Sometimes Annie and I discuss what it must be like to be superheroes. 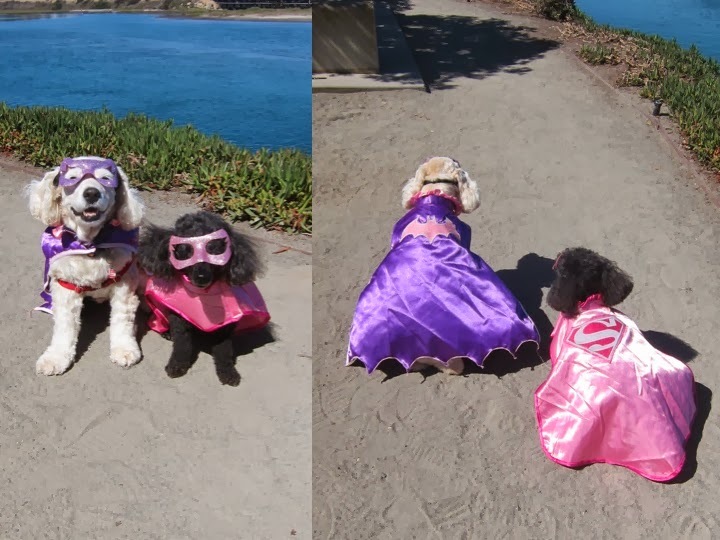 So I saw an opportunity for outfits and got Annie a purple batgirl cape, and me a Pink Supergirl cape. So now that we have our transformational disguises, we are trying to figure out what our mission should be. Any ideas? You & Annie are the most beautiful Super Heroes I have ever seen. There are human ladies out there that would totally want to wear your capes, hehe. Omg I LOVE your outfits! My favorite colors. One of your missions could be to make sure pups everywhere are fashionable! I think your mission should be making sure all puppy dogs have loving homes! It only makes sense for you two! Rosy you are such a fashionista I think u should make sure dogs the world over know they can be fashionable too, and of course Annie would be your sidekick! Your costumes are adorable! You both look like lovely little butterflies! And of course, with those satiny capes, you WILL be able to fly! Annie looks so happy and you, Rosy, look so regal. We think your mission should be to bring love and smiles to everyone everywhere, which you already do so...Mission Accomplished! Your mission...should you choose to accept it....is to patrol the streets of America, and make sure all doggies and kitties are safe and loved, and to make sure they have access to lots of snacks and tennis balls. ...and let me add how cute you both look!! You ladies are so rockin'!